Ok, I posted some of hallie burton's photos this weekend but I just couldn't resist posting more, as I honestly cannot stop thinking about how much I love the spaces that she has photographed. She captures the colors and textures so well! I just adore exposed brick and just love them against such modern light fixtures. I haven't really liked pink since I was younger but these hot pink chairs are just incredible! Still head over heels for canary yellow. Love this black tub and the painted brick walls--just perfect! Not totally my style but I just love this bright blue poster (and its words) against the perfectly white minimalist room. 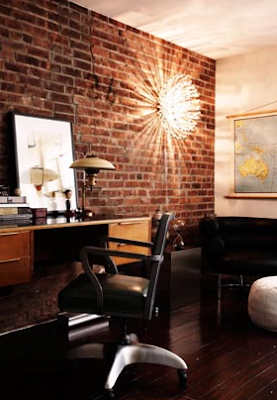 I love the exposed brick walls! Gorgeous pics! Those yellow chairs are real scene stealers. And I love your little sneak peak into your pup's funny habit. she's so adorable. hope you had a great weekend blair! Love the pics, especially the brick walls...and that yellow chair!!! So beautiful! 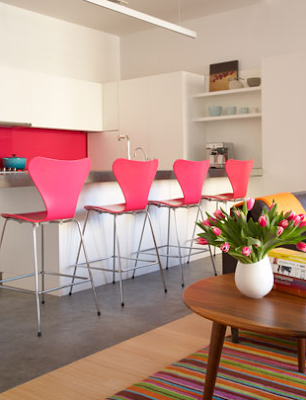 I love the hot pink against the white kitchen bench. Love the lamp in the first image - so unique and gives off such a nice light. Those pink chairs are fabulous! And, of course, I'm loving the bits of bright yellow. Lovely photos! Is that The Viceroy Hotel in Palm Springs (canary yellow photo)? Ohh, I want that dining room! 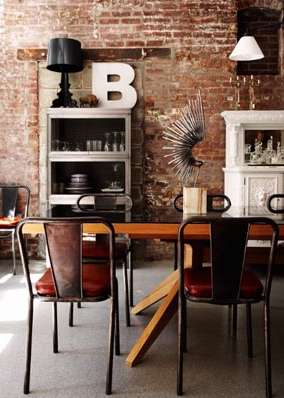 The exposed brick, the industrial shelving, the chairs, the table! How perfect. The yellow chairs are beautiful, and I adore the bathroom too. Great spaces, and you're right, the photographs capture them well. Can't decide if I like the painted brick walls or the exposed brick walls better! Rachel,I know, such tough decisions! Lizzie, they definitley have those chairs at the Viceroy Hotel but I am not 100% if it is the same room. Her portfolio unfortunately didn't list locations. love these images. i especially love the ones from the vicerory hotel. 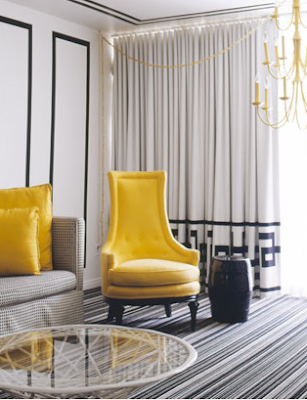 oh, i'm in love with the room with the yellow chairs! those chairs are so me! i'm pretty sure my husband would not like them, but that's why you buy a big house with spare rooms, right?? Oh I Love the yellow chairs and the pink chairs and the blue poster!! 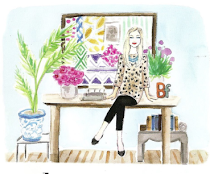 Neutral decor with flashes of brights are right up my street!